Executive Summary: Gordon Freeman is plucked out of stasis by the mysterious G-Man and returned to the world only to find humanity under the heel of the Combine, a extradimensional species. Gordon soon finds himself reunited with Barney, Dr. Kleiner, and Dr. Vance from the first resonance cascade incident at Black Mesa. They're soon attacked by the Combine with Vance and Mossman (another scientist) taken to Nova Prospekt prison. Using some alien technology and good old human ingenuity, Freeman and Vance's daughter Alyx free Vance and Mossman but must escape through a Combine teleporter. They soon learn that they were in a "slow teleport" for a week and find that a resistance has risen up, inspired by "the free man". In the struggle, Alyx is captured and taken to the Citadel, the dark heart of City 17. Freeman and his allies attack the Citadel, but Freeman is captured and delivered to Dr. Breen, another scientist from Black Mesa who's been collaborating with the Combine to give himself a position of power. Freeman escapes custody, joins up with Alyx, and destroys the portal reactor the Combine intend on using to further their goals of conquest. Freeman and Alyx are again frozen in time by the G-Man, just before the explosion consumes them. Dystopian Visions: From the beginning of the game, humanity is defeated. In a very early scene, the extent of this is demonstrated with a simple task. A Combine soldier knocks a soda can to the ground and tells Freeman "Pick up that can". The game will not progress until Freeman picks up the can, and deposits it into the trash can. Failure to comply, or throwing the can at the soldier, just means that Freeman gets a whack from the soldier's truncheon. Further along, small robots zip around in the air and photograph your actions. State messages (in Breen's voice) are broadcast over loudspeakers and on big screens. The rest of humanity are living in slums, unable to reproduce due to the Combine's suppression fields, waiting to die. If this isn't bad enough, the Combine suppress resistance by hauling resistance fighters to prisons like Nova Prospekt, where they're tortured and mutated by alien technology. Utopian Undercurrents: There's not so much utopian undercurrents as a dream of humanity regaining control over its own destiny. Half-Life is the story of science gone horribly wrong. Man's hubris is blamed for the resonance cascade that started the alien invasions in the first game, and by the second game, humanity is almost done for. The only hope is Freeman, a veritable agent of chaos in a protective suit that no force can seem to account for. But as the word of Freeman's exploits spread, and after the escape from Nova Prospekt, humanity has hope and that has to be enough. Level of Hell: Eighth, then sixth. When the game starts, there's no hope. As Freeman continues to wreck Combine plans, there's some hope that the human race will see this through, or you might die under the banner of the one free man. Legacy: Half-Life 2 was transformative for first-person shooters in terms of playability, in-game physics, and environmental storytelling. It was followed up by two "episodes", shorter chapters of the story that never saw a concluding chapter. There's a reason why the people who've played this game clamor for an offical third entry, and it's not simply because the series was left on a cliff hanger. It's because Half-Life 2 has left a mark on those who played it. In Retrospect: Half-Life 2 was and is an amazing video game. It has a simple but powerful story of humanity clawing its way out of the grave, being lead by the free man. 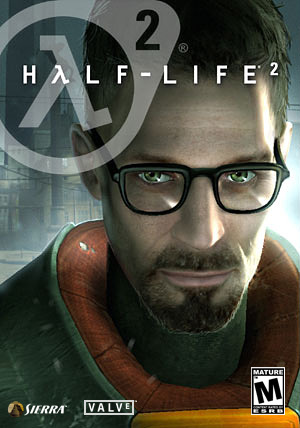 Gordon Freeman is transformed from mere video game protagonist to symbol of hope. But hope is little without seeing a world without it, and it's impossible to forget that time you were told to "pick up that can".